Furthering its partnership with the Spanish services provider, satellite and IP technology provider Forsway has won a contract to supply its Odin F-50 router to Spain’s Digisat Media for enhanced service delivery. In what could bring a welcome boost to the company’s currently underperforming video business, satellite operator SES has confirmed the operational switch-on of its SES-14 craft at 47.5 degrees West. incorporating multiplexing, uplinking and satellite services. 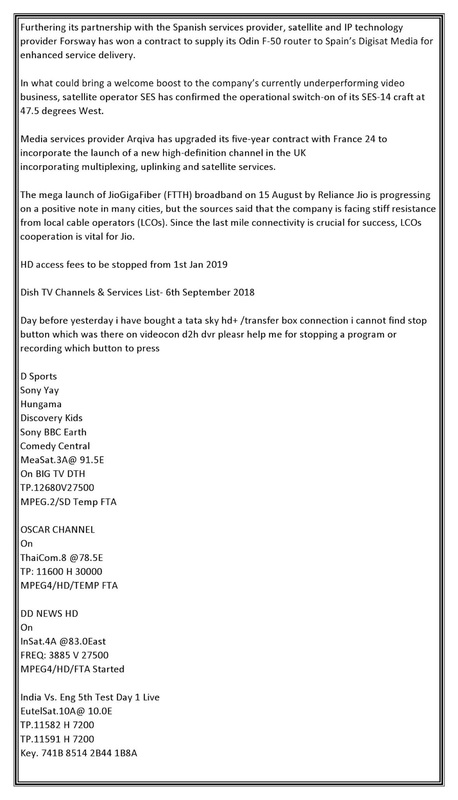 The mega launch of JioGigaFiber (FTTH) broadband on 15 August by Reliance Jio is progressing on a positive note in many cities, but the sources said that the company is facing stiff resistance from local cable operators (LCOs). Since the last mile connectivity is crucial for success, LCOs cooperation is vital for Jio.